Albuquerque loves green chile stew. Purists will tell you that the best is made with chunks of pork, the kind that has a bit of fat, but not too much. The chopped green chile that goes into it should be roasted, and it should have a bit of kick, though just a bit, not overpowering. While some are made with beef and others with chicken or pork, any green chile stew worth its salt is sure to include potatoes, onions and plenty of fresh green chile. Green chile stew is a New Mexican comfort food, something to order on a cold day, or when you're in the mood for something familiar and delicious. There are some places around Albuquerque that wouldn't let a day go by without a pot of green chile stew cooking on a burner somewhere in the back. Lucky us! Here is a list of our favorite spots. Cecilia's Cafe in downtown Albuquerque is a local favorite. Get a bowl of red or green chile with just beans or with beef or chicken. Cecilia's was featured on Guy Fieri's Diners, Drive-Ins, and Dives. 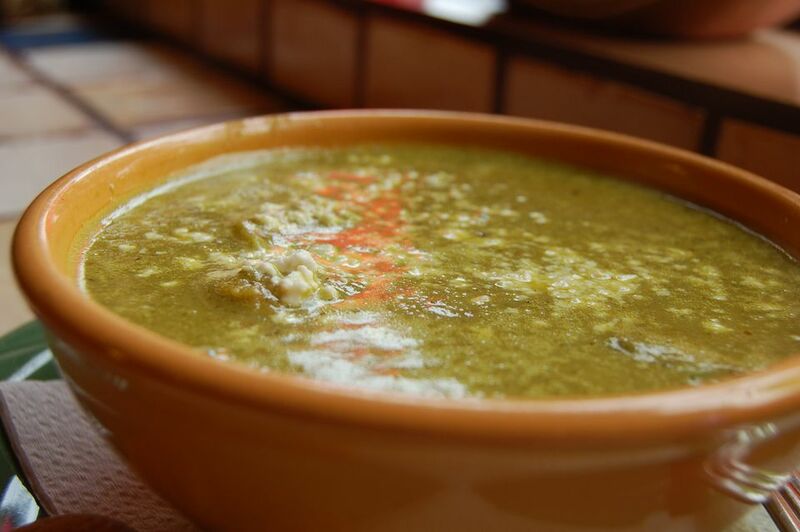 The address is 230 6th Street, SW.
Cervantes: The longtime Albuquerque favorite has its own product line of sauces and salsas, so it's no wonder that they cook up some great green chile stew. They make it the traditional way, with pork, potatoes, and lots of green chile. The address is 5801 Gibson Blvd, SE. Cocina Azul makes Azul bowls of green chile stew with Hatch green chile, steak and potatoes, served with a sopapilla. They also have bowls of red chile stew and posole. They're located at 1134 Mountain Rd NW and 4243 Montgomery Blvd NE. Duran's has a bowl of chili with beans, meat, red or green chile and a tortilla. The address is 1815 Central Avenue, NW. El Pinto fire roasts their green chile and adds chicken, potatoes, and corn served with a flour tortilla. The address is 10500 4th St. NW. The famous Frontier Restaurant offers green chile stew or posole in 5, 8 or 12 oz. bowls. Their 5 and 8 oz. bowls come with one tortilla, the 12 oz. bowl with two. They also offer a vegetarian tortilla soup that is similar to green chile stew, which comes with tortilla chips and cheese. Take off the cheese and make it vegan. Garcia's Kitchen is so popular with locals that it has grown to eight locations. Their green chile stew features beef strips, potatoes, and green chile in a rich broth. Choose a tortilla or sopapilla for dipping. They also have posole (seasonal) and menudo with corn. They have 7 locations. Golden Pride, like its sister restaurant the Frontier, offers green chile stew. Pick up 8 oz. with one tortilla, 12 oz. with two tortillas or 16 oz. with no tortilla. They have 4 locations. La Salita in the northeast heights offers green chile stew made with marinated pork, pinto beans, onions, and green chile strips, served with two tortillas or two sopapillas. They also have a bowl of red chile, with ground beef, pinto beans, and red chile. The address is 1217 Eubank Blvd NE. Mary and Tito's Cafe: Get a bowl of red or green chile, with or without beans, at one of the most celebrated restaurants in the Duke City (2711 4th Street NW). Monroe's puts together pork, potatoes and green chile in a 16 oz. bowl with two tortillas to sop it up. They also have a bowl of just green chile (or red chile) for those who love the stuff. The address is 6051 Osuna Road NE. Ortega's calls their green chile stew a bowl of chili, but it's got the red or green chile, potatoes, ground beef and whole beans that make it a tried and true stew. Order it with brisket for a little extra. The address is 3617 Wyoming NE. Pueblo Harvest Cafe has a variety of stews, from green chile stew with chunks of pork to a feast day stew with mutton. Find this chile at 2401 12th St NW. The Range makes their green chile stew with chicken, with a flour tortilla for dipping. Get a large cup or a big bowl. They have 3 locations.